Time to revive the Sprite game! Quote: This is a game where you start out with a simple LF2 sprite, then each player may edit it using any graphics program of their choice. You may choose to edit a small portion of the sprite (head,hair,pants...etc) and don't edit more than once in a row so that other members will have a chance to put in their edits. Rule 2) Think outside the box! feel free to add anything that comes to your mind, just be creative with it. Rule 3) NO Dirty work. you can use imgur to upload your sprite. 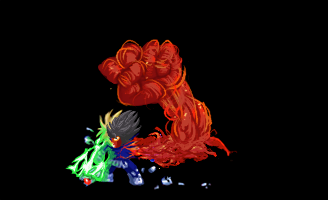 The sprite can be considered as "finished" once there is no more room for anymore edits or improvements. After that any other respected member may add a new sprite of their choice to start a new round. Rule 5) Respect other members edits! Do not simply discard them because they're not up to your tastes. Note: below each sprite are the names of participated members. done? new one? pretty please? Current time: 04-24-2019, 07:09 AM Powered By MyBB, © 2002-2019 MyBB Group. Theme created by Silverthorn.